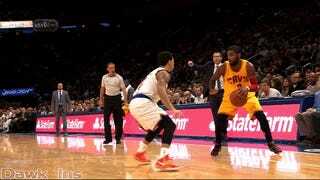 Last night's nationally televised game between the Cavaliers and the Knicks was pretty stinky. 'Melo couldn't get a bucket, LeBron was still in "Hey, uh, what the hell is going on with LeBron?" mode, and the whole game had the feel of two middling Eastern conference teams blindly flailing at each other. But then there was Kyrie Irving, who scored 37 and brought a little spark to the night by repeatedly making people look stupid. He never dropped anyone to the floor with an especially nasty crossover or spin move, but he didn't need to. His handle never seems to widen or wobble out of his control, and he uses it to turn every one-on-one situation into a series of twitches and micro-explosions that put defenders in a tipsy-uncle-at-the-Christmas-party stance. Watch him spin and glide past two defenders at 1:00 in the video above; watch him teleport past Pablo Prigioni with a behind-the-back dribble at 1:06; watch him permanently damage Jose Calderon's equilibrium at 1:28. The Cavs are probably going to become the world-destroyers they were supposed to be sooner rather than later, but at least we'll have Irving around to entertain us until that happens.